Slot cars are electric toy miniature cars that run around a track that has a slot or a groove that guides the car as it travels. 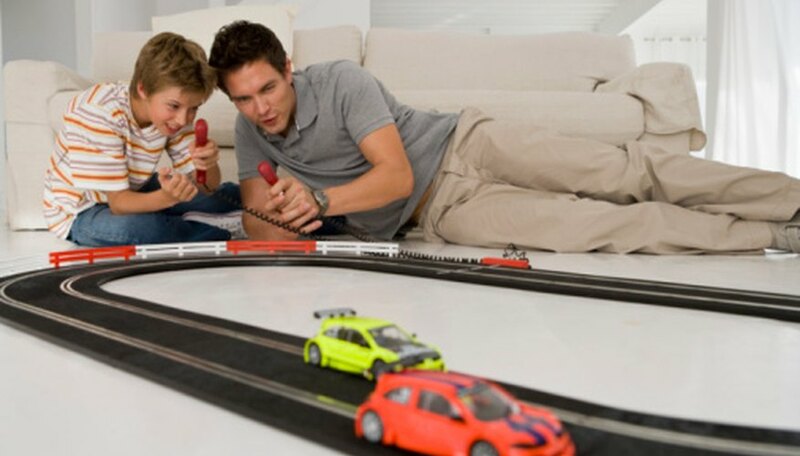 The slot car's track has a wired control that modifies the slot car's speed as it races around the track. Slot cars generally are models of real cars. They come in 1:24 scale, 1:32 scale, and HO scale models. Slot cars can be commercially bought or you can make your own. Many slot car owners like to make their own tires for their cars with a silicone mold. Measure out the components of the silicone rubber mold mix according to its packaging instructions. Pour them into a plastic cup and mix thoroughly with a wooden craft stick. Insert the slot car tire axle rod into the wheel. Place the wheel into the plastic cup. Pour the silicone rubber mix over the wheel until the top of it is covered. Wait 24 hours for the mold to set. Once it cures, remove the wheels and axle. You may have to trim some of the mold off the top of the tire with a craft knife before you can pry it out with your fingers. Mix together the components of the mold resin according to its packaging instructions. Insert a new axle rod for the tires into the mold. Pour the resin into the holes and completely fill them up. Let the resin sit for 30 minutes. Remove the tire from the mold. If you can't find any tire axles, you can make your own from 1/8 O.D. steel rods.